Vertical Material Racks (VMR) provide long-term storage for varying lengths of bars, pipes, lumber, and similar construction and manufacturing materials. Heavy-duty casters also allow the entire unit to move, bringing bulk materials directly to production lines or installation sites. The VMR secures contents safely within its frame with four rows of steel retainer bars and a rubber anti-skid surface at the base. The varying heights of the crossbars allows users to store materials of different lengths within a single unit. This also improves the picking process by organizing items clearly into different slots. Meanwhile, the VMR’s narrow footprint preserves floor space for other uses. 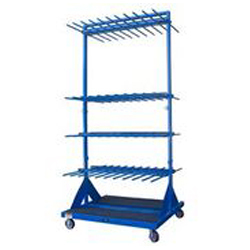 BHS offers two stock models of Vertical Material Racks. One has a single compartment, while the other places two compartments on either side of the central frame for twice the storage capacity. Both models are designed for industrial use, with steel construction and a rugged powder-coat finish. In addition to stock models, BHS offers unique custom designs. Discuss the options for your next bar-and-pipe rack by calling the BHS sales team at 1.800.BHS.9500.